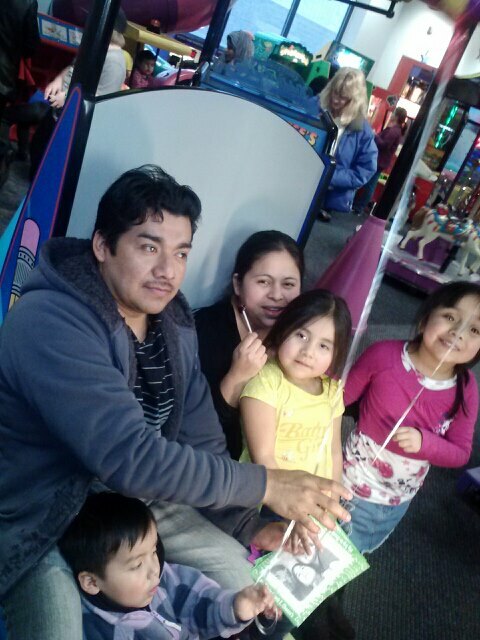 Arely with her partner and children at a birthday party for the youngest child, Jesus on Jan. 16, 2013. On Jan. 8, Arely Tomas Orozco was travelling on 81 South with her partner, Hector Antonio Navarro, to pick up a friend from work. The vehicle was stopped by state police for having an expired registration. After Hector presented police with identification from Guatemala, the police proceeded to demand documentation from the vehicle's passengers. State police detained most of the passengers--including Arely, her 3-year-old son, and her friend, Fredy--for almost two hours and then made Hector drive to the nearest rest stop. There was absolutely no reason to detain all of the passengers, and it was a clear violation of their civil rights. The police then called Border Patrol, who needlessly interrogated and then arrested Arely. Earlier, Arely was detained by Border Patrol in Pheonix, AZ, while she was waiting with her child, Karen, who was 3-months-old at the time, and sister. Without a shred of evidence, Arely was accused of just having crossed the border from Mexico with her baby. After Arely and her baby spent three days in jail they were released after proof was provided that Karen was a U.S. citizen. After this injustice, Arely and her family moved to Central New York, where they had friends and were told they could find work. Unfortunately, Arely was never able to settle the legal matter in Arizona. When she was detained by ICE in New York, she was ordered to be deported "in abstentia." Because of the intervention of activists, Arely was released on Jan. 18. She spent eight days in jail, five of which she was confined alone to a cell, only able to leave to take a shower. This ordeal has had a devastating impact on all of the children, especially the 3-year-old, who is traumatized, having been subjected to this harassment for nearly three hours before watching his mother get taken away. Arely's court date is scheduled for Jan. 30. Arely must show that she has applied for U.S. passports for her children, which she has done at a significant financial burden. It is possible that the judge could grant her more time. More than anything else, Arely and Hector want their five and six-year-old daughters to finish the school year before leaving for Guatemala. Arely, Hector, and their family have done nothing wrong. They are being punished because of the anti-immigrant policies of ICE and the Obama administration. Please take a moment to sign this petition to ICE to demand that deportation proceedings against Arely be halted immediately, and stay tuned for updates about how you can get involved in this struggle! This struggle is being supported by: Workers' Center of Central New York, Hispanic Coalition NY, ANSWER Syracuse, and others.